February 12, 2014 By Allyson 17 Comments This post may contain affiliate links. Read my disclosure policy. 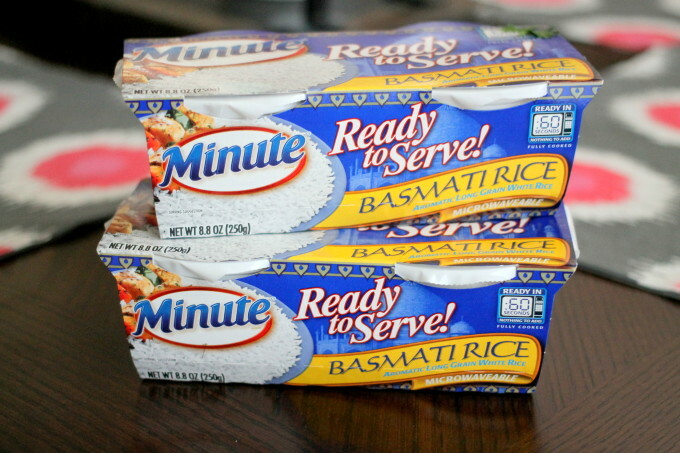 I was really excited to partner with Minute® Ready to Serve Rice on this post! As many of you know, Mexican food is my jam. I seriously love it. I love the flavors, the variety, the occasional spice….it’s the best. However, being a vegetarian really limits options when it comes to Mexican food. All the meat is usually substituted with cheese, and sometimes having a cheese filled enchilada is just too much cheese (sounds impossible, but true). I really love having vegetable substitutions and am obsessed with spinach and black bean enchiladas. Yum. Anyway, when I saw a recipe from Sweet Bella Roos, I knew I had to make it, but clearly some modifications needed to be made in our (vegetarian) case. 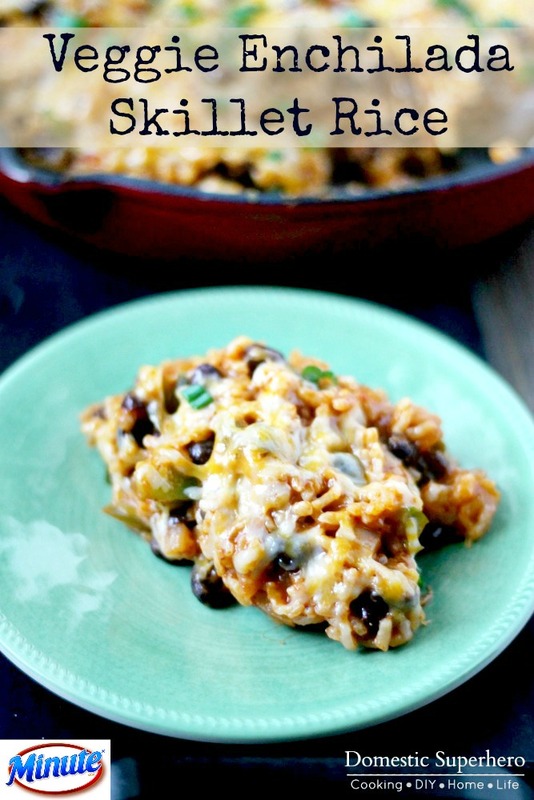 Substituting the ground beef for black beans was the biggest change, and it was still so hearty and delicious. This is a great meal for meatless Monday or for those times you just don’t want to spend extra money on meat. 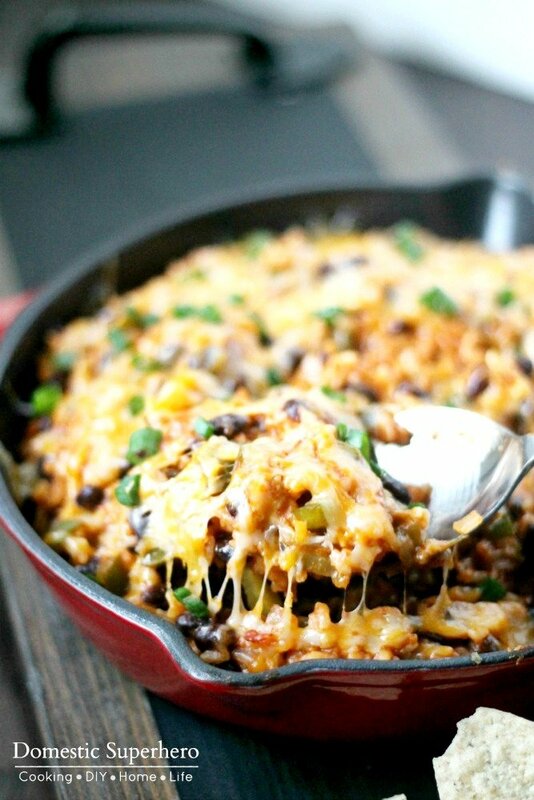 It’s really fabulous without it, and I know this Veggie Enchilada Skillet Rice would please even die hard meat eaters. You won’t miss the meat, trust me! It’s also great reheated! I love using Minute® Ready to Serve Rice with this recipe, because it really takes the cooking time to only a few minutes! I like the Basmati variety which is the new Ready To Serve variety, but you could really use any of their various types because there are so many: all new varieties such as Brown & Quinoa and Basmati Rice, as well as Whole Grain options of Brown Rice, Brown & Wild Rice and Multi-Grain Medley. 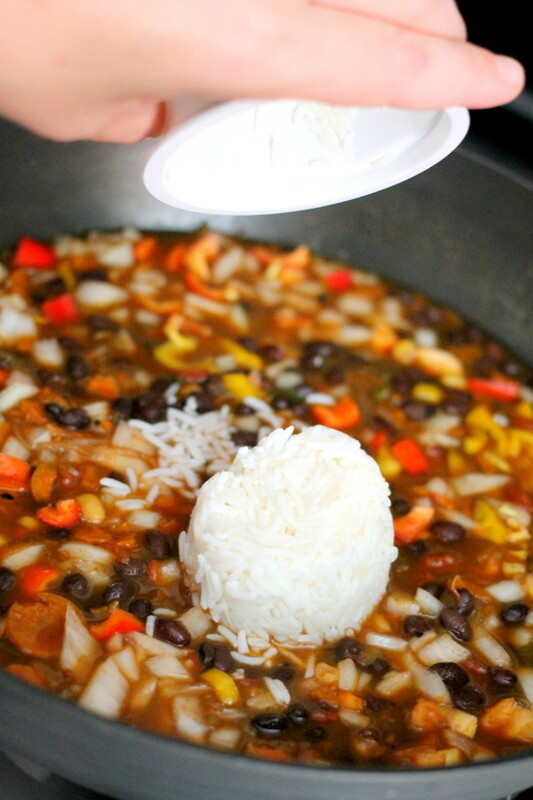 Also, there’s Jasmine Rice, White Rice and flavorful mixes – so the sky is the limit! After you make your base of the recipe, you just add 3 cups of the Minute® Ready to Serve Rice to the skillet – super easy! It’s nice because the portions are already measured out, so it’s easy to keep track of how much you are using. Another reason I love Minute® Ready to Serve Rice is because it’s an ideal portable solution for lunch or breakfast (or really any time of the day) because you can eat it on the go, straight from the cup. In just 60 seconds, you have fully cooked rice for any meal or snack. You’ll never get bored with your lunch since there are several flavorful and wholesome varieties! Then all you have to do is add your cheese! Yum, super easy and delicious! 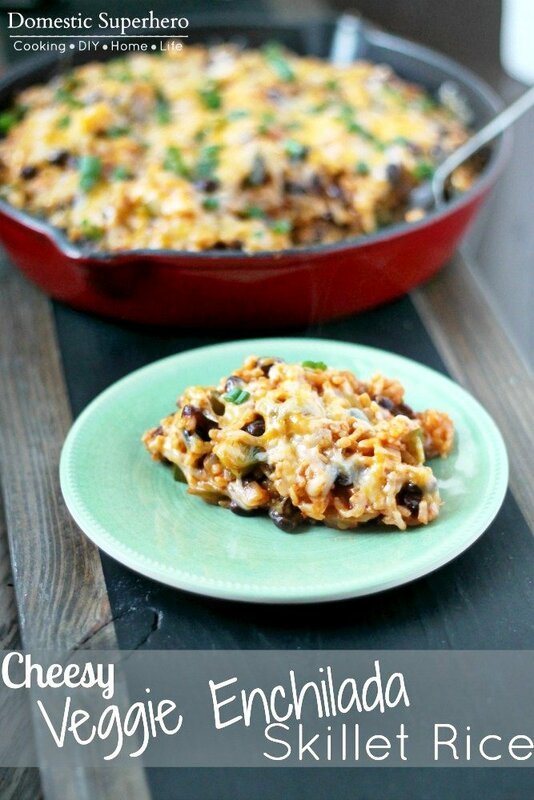 I served this skillet with a side of tortilla chips because we are a chip family, however it would be equally delicious with tortillas (omg delicious burrito filling! ), on a salad, or just plain. It is seriously so delicious! Lastly, if you don’t want to do the whole meat-free thing, just follow the original recipe I linked above! You can use ground beef/turkey/chicken, or whatever protein you want. 1. Place olive oil into large skillet and add onion and bell pepper, cooking for 2 minutes over medium heat. 2. Add chili powder, cumin, black pepper. 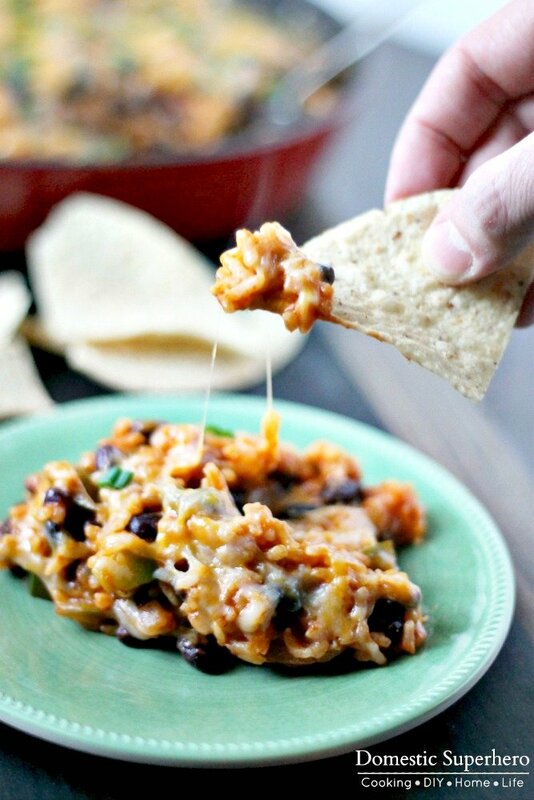 Stir in enchilada sauce, 1 cup cheese, black beans, and rice. Combine well. 3. Season with salt and pepper to taste and heat for 5 minutes, simmering. 4. Top with remaining cheese and cilantro (optional). Allow cheese to melt and serve. You can garnish with additional items if desired; olives, green onions, sour cream, greek yogurt, jalapenos, and salsa would all be great toppings. This is a sponsored post written by me on behalf of Minute® Ready to Serve Rice, however all opinions are my own. 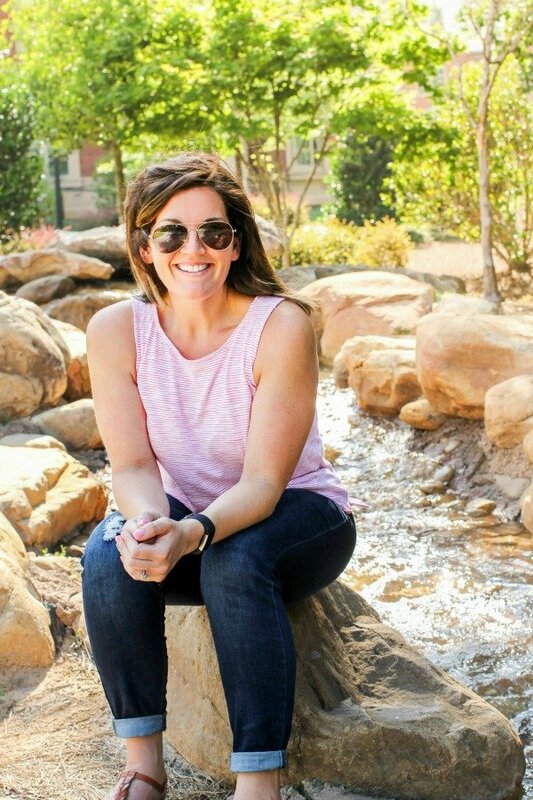 I hope I inspired this with my quinoa one! Lol I’m sure just a coincidence, but I’ll be flattered anyways. I actually made this like a month ago, and finally got around to posting it 🙂 BUT, Your quinoa one sounds amazing too, and that’s definitely on my list….you know how i love me some quinoa! This sounds really good! I agree about cheese enchiladas. 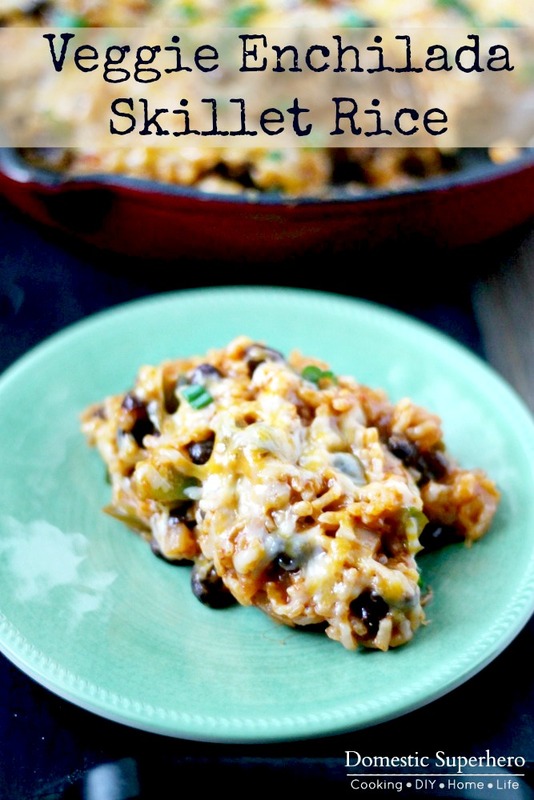 Shockingly, they are just too much cheese for me, but I love sweet potato and black bean enchiladas! It’s hard to believe there is such a thing as too much cheese (like say, it’s impossible when it comes to Mac and cheese), but I just can’t stomach the block of cheese in cheese enchiladas! I bet this skillet would be really really good with cubes of sweet potatoes! Do you think this would freeze well? If you cooked and cooled the rice, then put all the ingredients in a baggie? I have made the whole dish and then froze in baggies, and it was great!